A classic tale of split personalities, this online slot from Ash Gaming captures something of mankind's dark side in a light-hearted, entertaining way. The real question is, which aspect of you will lead to that juicy jackpot? 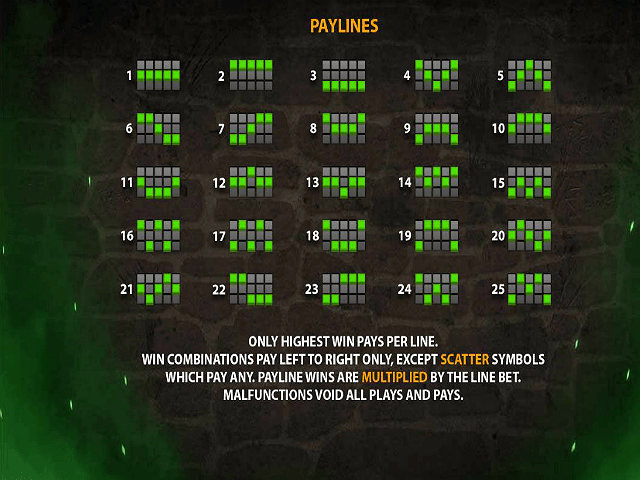 This five-reel 25-payline slot is easy to play, and the battle between Jekyll (or is it Hyde?) and his alter ego has even been worked into the game itself, which makes for an interesting feature. There's a wide bet range too, so it's great if you want a little spin for fun, or equally a high-stakes experience. 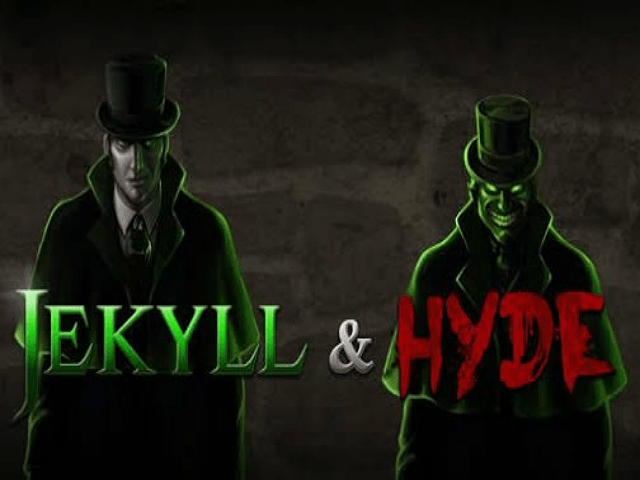 Play Jekyll and Hyde for Real Money! There's no getting around the fact that Robert Louis Stevenson’s original gothic tale of respectable Dr Jekyll who transforms into the evil Mr Hyde is rather dark in nature, so the deep greens, reds and blues used in the graphics are fitting here (make sure not to confuse this game with the Dr. Jekyll and Mr Hyde slot by Betsoft). Ash Gaming has done a good job of keeping it light where possible though – it's a game not a horror film, after all. The characters are menacing yet cartoony enough to not be truly disturbing and put you off your play. There's no music, just eerie mutterings, so if you're of a nervous disposition it's probably better played with the sound off – especially in the office, or colleagues might think you're having a bad day. The dull colours can make the info bar at the bottom a bit more difficult to read than is the case with other slots. Symbols are a mix of characters in the story (including Jekyll and Hyde), potions and poisons, books, and the standard letters you'll find on most slot reels. The potion itself is the scatter, which activates the free spin mode. More on that in a moment... Wins pay from left to right as you'd expect, and there's a maximum bet of 250 coins. The return is just over 95%, and there’s a feature bet mode to up your chances of winning even more. If you combine this with the bonus mode, there's some serious winning potential. 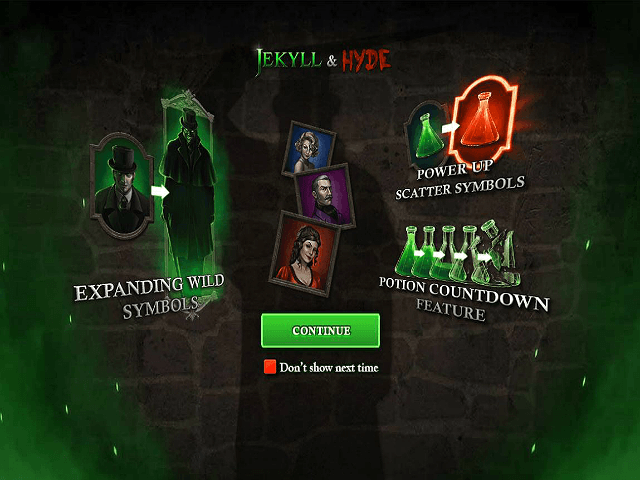 Jekyll himself is the wild, but the scatter symbol (the potion) is what triggers the interesting free spin mode. If you can get at least three potions on any of the reels (with a maximum of five), then you enter the free spin mode. 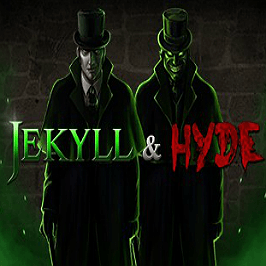 Here's where it gets interesting – you can now choose between Jekyll or Hyde spins. Jekyll spins get multiplied, and the multiplier will increase every time you get a wild on any reel. This is great for building up momentum for a big payout. However, perhaps you'd prefer the more animalistic unpredictability of Hyde. His mode means that any scatter you get transforms one of the highest paying icons to a wild instead. While it seems fairly standard at first, the free spin mode really sets this slot apart from the rest, and gives you more control of how you approach your odds. Just like the ‘strange tale’ it takes as its theme, it has the elements for success. Share this Jekyll and Hyde Review today! 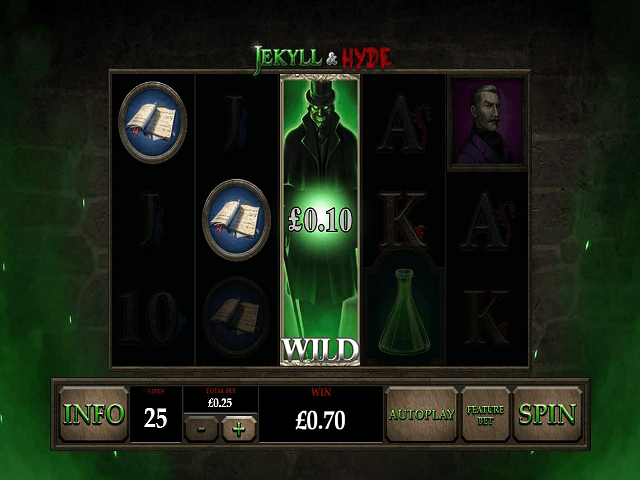 If you like Jekyll and Hyde , you'll love these slot titles too!